Today my lovely Isabella turned nine years old! She came into the world in the wee hours of the morning and looked like a little a doll. Perfect in every way and so small!!! She is a beautiful girl and I love watching her grow. Last week she asked if she could have a 'friends' party. Since Isabella hasn't had a 'friends' party since she was in prep (first grade), I, of course said yes. She then asked if she could have a Harry Potter themed party. I, of course said no (way too late notice!!) 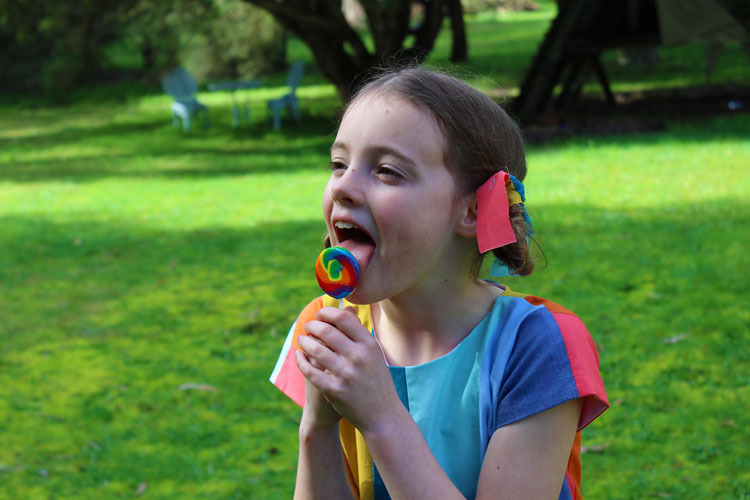 and we settled on a rainbow theme instead! 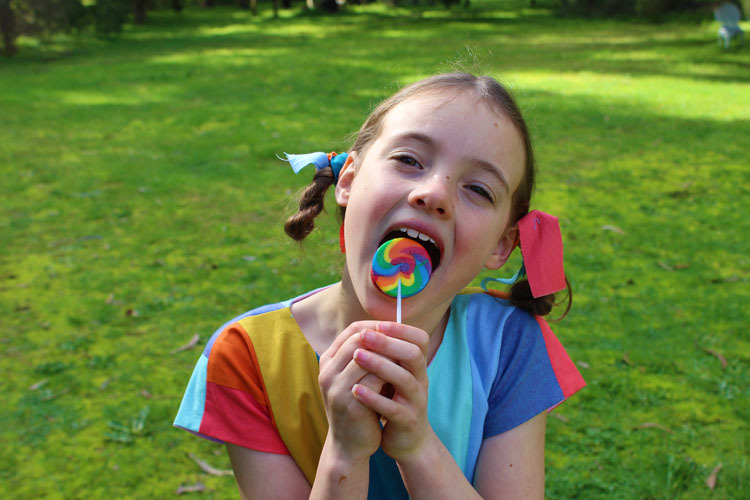 Each of her friends received a different coloured invite and came dressed in their colour. 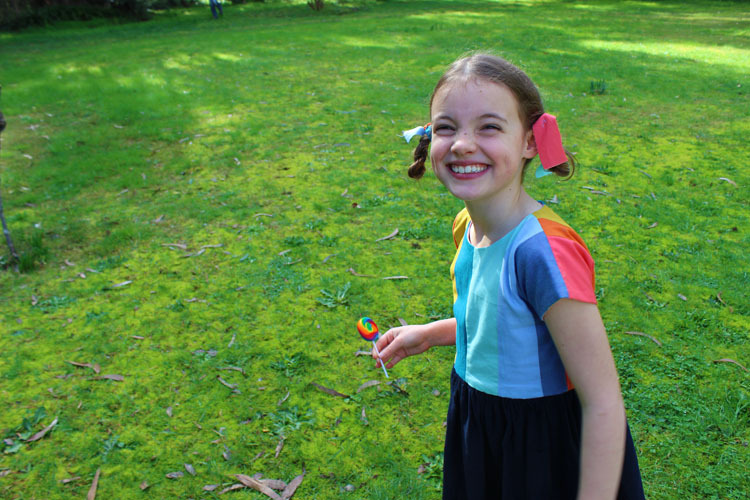 Isabella, being the birthday girl, wanted to be rainbow coloured. I scoured my local fabric stores for rainbow fabric - but the obvious rainbow selections there were too 'rainbow' and also too young. I was also feeling guilty about spending too much on fabric lately so came away from the shops empty handed, but determined to source some 'rainbow' from my existing stash. 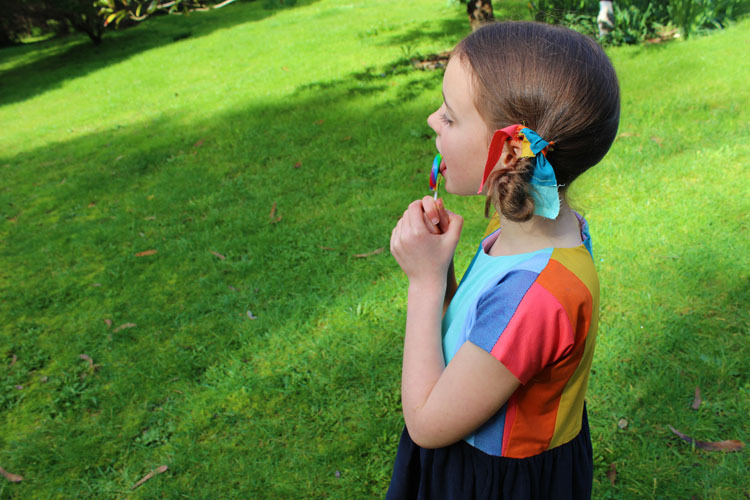 We started pulling out scraps from my colour coded scrap bags and managed to find a great selection of modern rainbow colours! I immediately began sewing asymetric strips together to create some rainbow fabric. 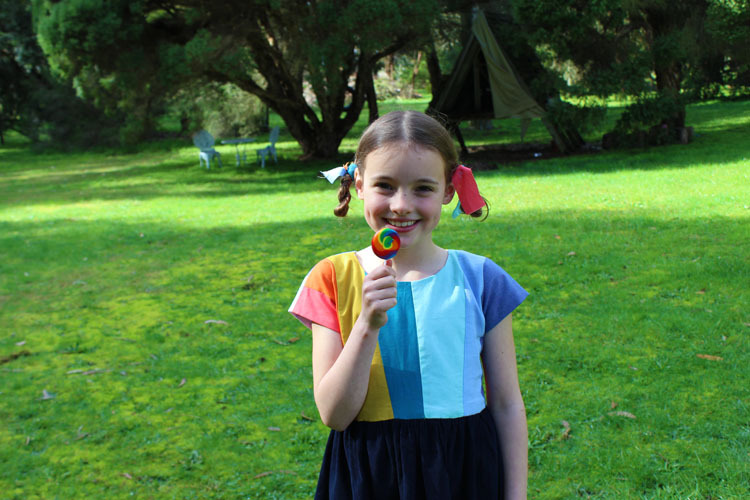 Once I created two pieces of rainbow fabric for the front and two backs, I laid my pattern pieces on the rainbow fabric and cut. 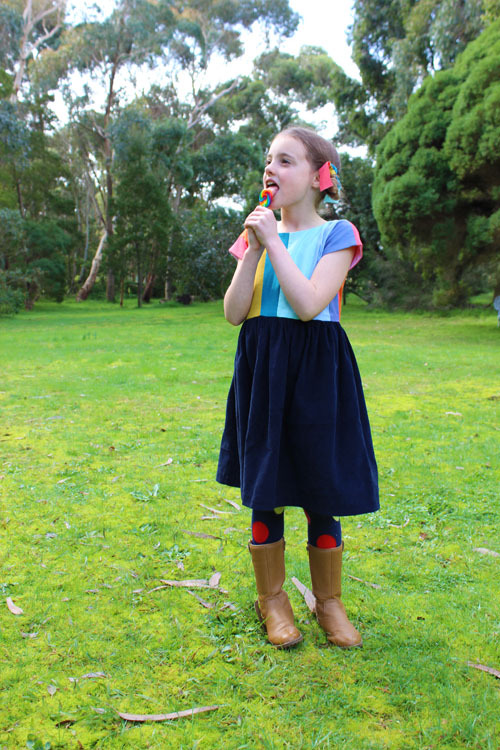 I used the free Dulcie dress pattern to make the dress, with a slightly shorter bodice and longer skirt. 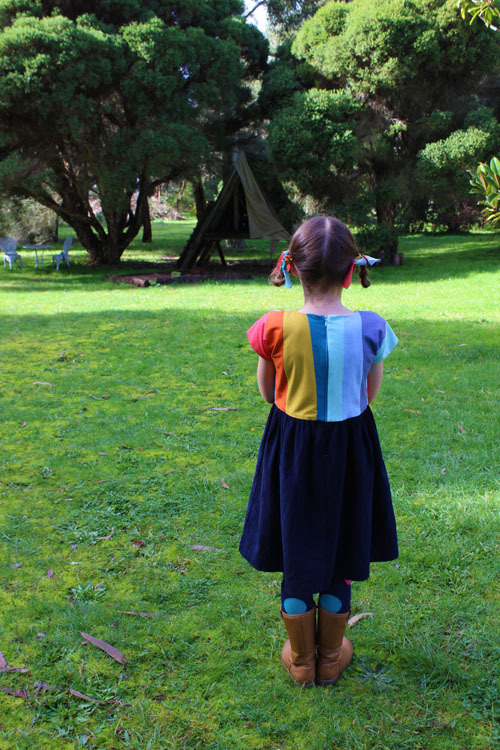 Since it is still winter here in Australia, I paired the rainbow bodice with some navy pinwale corduroy I had in my stash for another project that failed to eventuate! This little (big) girl had a wonderful birthday and is so happy to be nine! You can check out my IG feed to see the awesome rainbow cake made by gorgeous sister. Thanks Jenya! Her first day being nine went well! Happy birthday Isabella!! Beautiful dress and party idea! I love that your scraps are color coordinated! Waw, the dress turned out really great. Really love iT! Happy birthday to Isabella! 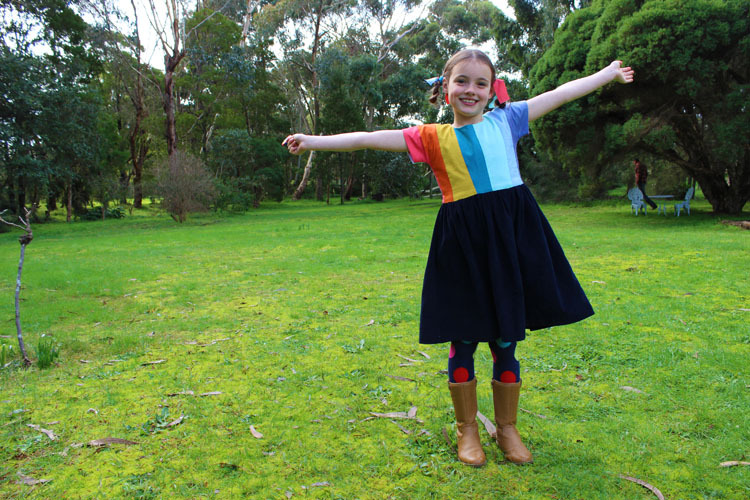 You made her the perfect rainbow dress! OOOeeeh nine already! And the dress is so cool! Her smile tells it all. This dress is simply stunning! I love it. What a great idea to use colour coded scrap bags. I'm planning on organizing my sewing stuff, so this is a perfect idea to keep me from diving into boxes with scraps, finding that perfect match for something.